The Philadelphia Boys Choir & Chorale tour this summer was to Singapore and Vietnam. 73 boys and 17 men represented Philadelphia as America’s Ambassadors of Song in Southeast Asia from July 4 through July 19. As in the past, boys still do not communicate directly with their families at home but with technology allows parents to receive periodic email updates from artistic director, Jeff Smith. We thought you would enjoy “traveling” along vicariously with some highlights from his emails sent from across the world. Wow….what an exhausting first day. But we knew it would be. The first day is always the toughest – between traveling for 20 hours straight and the 12-hour time change, it doesn’t get much harder than that. On the 4th, we arrived at JFK with plenty of time to spare. We sang “America, the Beautiful” while waiting at the gate. The others at the gate loved it! Several people came up to me, very impressed with the group. And I have to say – they did a great job! I was also proud to have a military vet come up to me to thank me. We told the boys to try to stay awake on the first 6-hour flight (to Frankfurt) – which wasn’t difficult since they were all excited about the start of tour. We landed in Frankfurt, got off the plane and had about 1.5 hours to kill. I couldn’t help but use that time to practice the Singapore National Anthem and the Vietnamese folksong. The people in the airport were delighted. We got back on the plane for the 12-hour flight to Singapore. A few boys had some stomach problems and even home-sickness on the first flights, but that always happens. But when we landed (on July 6th morning), and got out of the airport, everyone seemed back to normal – ready for a great tour! We hopped on the buses for the “Flower Dome”, where we went right through security into the conference room for a sound-check and rehearsal. Sound check took longer than we had hoped – they must have sung the first few lines of “Star-Spangled Banner” 20 times….without complaint though! The boys were now looking super tired. Some were falling asleep whenever they sat down. But we knew it would happen….we tried keeping them up…and they plowed through it. I have them a little pep talk before the performance, and they pulled it off! They had to stand on this small stage, on either side of the podium, for about 20-30 minutes during some long political speeches (one from an American with an important title at the Embassy, and one from one of the mayors of Singapore) – and most of them stood still and looked sharper than they usually do. This was a minor miracle – they had a 20-hour transport, arrive in Singapore at 7am (which would have felt like 7pm to them), had a full day of sightseeing, and were beautifully singing the two national anthems around 7pm (which would have felt like 7am). I was so proud and impressed with them! They represented us so well, and the Embassy staff was ecstatic about the whole thing. As always, these boys pulled off a tough one, and I think they were proud of it too. I know I was certainly proud of them. Though it was tough, I’m sure glad we did it. A neat experience, for sure. So July 7th started with some walking tours of Singapore – the city center, including the sights by the bay (Merlion statue, Marina Bay Sands and more) as well as Chinatown. After lunch, we returned to our hotel for a short nap, and headed to the Esplanade. The Esplanade is the main concert venue in Singapore – a beautiful concert hall that seats about 1500. The performance was about 1.5 hours without intermission, and included a few of the commissioned pieces, some of our standards, and some of the popular songs from the 50 year anniversary. The audience really seemed to enjoy all of the music – but especially the popular music. They gave us a big standing ovation at the end, and we sang “Saints Go Marching In” as an encore. The next day I ran into several people who were at the concert and said how much they loved it and really enjoyed the new commissioned pieces. After the concert, a few of the boys went out to the lobby to sign CD’s that we were selling (always a draw….) and two of the boys had visitors (family or friends) that they met briefly as well. We also had an alumnus, Matt Hayes, who happened to be in Singapore and was able to come to the concert. It was nice to catch up with him. We continued onto Sentosa Island. This was the place where Donald Trump met with Kim Jong-Un. One could easily spend an entire day or two there, so we didn’t get to see all of it, but we visited the historical sites and then had a good hour on one of the beaches. The water was warm and the kids had a blast. After returning to the hotel to wash up, we had a Chinese dinner and sang happy birthday to one of the boys. As is tradition, the birthday boy got a little dessert cake, some of his favorite candy and some candy that’s specifically from Singapore. We ended the day visiting the “Night Safari”. This was a small theme park of sorts, which is basically a zoo, but meant to be visited in the dark. Most of the animals are in their natural habitat without fencing. We started with a train ride (in the dark) through the forest, viewing animals during their night life and then we walked through some trails to see some more animals. It was a neat experience seeing them at night, and in some cases, getting very close to them. We got up very early for our morning flight to Ho Chi Minh City (Saigon), Vietnam. We noticed the differences between the two countries immediately. Singapore was very modern, Vietnam was not. Vietnam reminded me more of some of the places we visited in China in past years. Singapore was more similar to only the most modern cities in China. Driving out of Saigon and into the Mekong Delta reminded me of many tours we’ve been on before – outskirts of cities lined with shacks for houses. Recently, back home I was driving through some very downtrodden areas and thinking “you know, we’re so surprised when we see the terrible conditions in some other countries, but some people in our own country live in those same conditions”. While I still feel that’s true, I think the difference is the percentage of people living in those conditions. We had a two-hour ride today, and for most of the ride, that’s what we saw. I think that’s the norm here or at least in the rural parts of southern Vietnam. When we arrived, we got on a few old boats that seated about 40 people and cruised down the murky, brown river. Beautiful day – humid, but not brutally hot – and of course, being on the river, there was a nice breeze. We arrived to our destination and were given a demonstration on making coconut candies – from the cracking open of the coconut to the wrapping of the candies. There were also some more unusual items to buy – like snake wine and scorpion wine – small bottles of wine with a dead snake or scorpion in it. I bought one for my sons…I mean, how cool would it be to have a bottle with a scorpion and a snake in it?! Speaking of snakes, we got some great photos of the kids holding a live snake (python, I believe). We’ve got some brave kids here – there wasn’t one kid in my group that didn’t hold the snake! Our next stop – and this was my favorite part of the day – was a little snack of fruit and honey, accompanied by some live music. The music was traditional Vietnamese – a singer, a guitarist, and someone playing the đàn bầu (one-stringed instrument with bow). We enjoyed the music, but it became transcendent when a group of about 20 or so Israelis joined us under the thatched roofed area. I found out that they were from a Yemeni community in Israel. 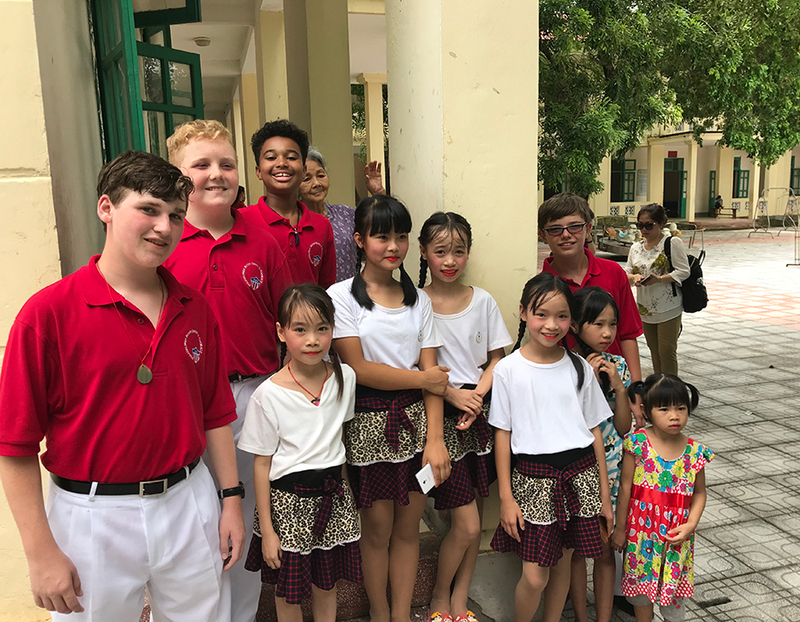 Several of them started dancing to the Vietnamese music – but they were dancing in typical Mediterranean fashion – in a circle, holding hands, raising their arms in the air. And then they asked our boys to start dancing. So these American boys started dancing in American fashion to Vietnamese music, with Yemeni Israelites trying the American dancing too. It was such a neat multi-cultural experience. We continued on our journey on a small boat – four people to a boat, rowed by a Vietnamese woman in the back. We enjoyed a refreshing coconut water drink on the ride. In our tour of Ho Chi Minh City we saw a temple, the Reunification Palace, and a few other sites. Following that, we went to the Ho Chi Minh Conservatory, where some students played for us and demonstrated their traditional Vietnamese Instruments. The group was fantastic, and we particularly enjoyed the solo selections they played. They continued with a Q & A session, and some of our kids had some really great questions. The last question led to them bringing one of the boys onto the stage to try one of their instruments. And that led to them asking any kid who wanted to come up and try the instruments. I’m quite grateful that they were brave enough to let our kids try out their instruments and the boys loved it. We then had a rehearsal onstage for the evening performance. Rehearsal went well, but a little long. We went to dinner then came back for a nap. The day was humid (again), and so the best place for a short nap was actually in the concert hall itself, where there was air conditioning. I woke them up 30 minutes later and it time to get dressed into the uniform and give a great performance. There was not quite enough room backstage for us all to stand, let alone get dressed, so we actually got dressed in the balcony of the concert hall….an unusual situation (!) but it worked. This performance was magnificent….which was much needed after a weak performance in Singapore. It was a small hall – maybe seating 600, and the acoustics were awesome – the choir was so strong and well-blended. The audience LOVED the concert – lots of applause and you could tell they were totally into it. The choir loved it too – they were so proud and knew they did so well. There were some gorgeous moments. We continued to the airport for a flight to Danang. It seems like a neat city, but we didn’t stay – we were bused to the city of Hoi An. Hoi An has a really cool feel to it – a very small city feel. Small streets lined with tons of shops and homes. We had another great dinner (I’m really digging Vietnamese food…) and celebrated another birthday. I asked the guides to help us get him some kind of dessert. Unfortunately, the restaurant didn’t have any dessert, so we made up a nice fruit plate and the guide bought a bouquet of flowers for the birthday boy! We continued to the hotel – the Hoi An Historic Hotel. What a beautiful place! It looks like a small resort. The next day we started at the beach. It was very humid AGAIN, and quite hot. The water was perfect and the boys loved it. We got at least two hours on the beach. Frisbee, tag, and all kinds of games in the ocean. We went back to the hotel for showers, then took a brief walking tour of the city. We then went to our rehearsal – it was an outdoor stage setup in their “Sculpture Garden”. Rehearsal was long and hot. The sound system was a mess, and not totally ready for us when we arrived. There was a power outage during rehearsal, so we had no sound system for a while. The kids were exhausted after the whole morning at the beach. But we got through what we needed to, and felt prepared enough for the concert. Then it was back to the hotel for a much-needed nap. Because of the heat, I decided to have them wear the choir polo shirt with white pants instead of their blazer uniform. There were some interesting speeches and introductions for this one – it seems like it was something they normally do. There was a minister of culture or someone important there, seated with someone else important, and John Stroud and I were asked to sit with them in the front row for this introduction. After we were introduced, I was asked to come onstage for an interview. The woman asked me a few simple questions (“Is this your first time in Hoi An?” “What do you like about Hoi An”, etc). During the last few questions, the rain started. (Remember, this is an outdoor concert). The audience started leaving. Someone came onto stage to cover up the keyboard. The woman finished her introduction, ready for us to begin, and I discreetly asked if we were supposed to continue in the rain! And if so, I need to use the keyboard, which has just been covered in plastic. She seemed puzzled, as if to say “Of course you should continue!” Some of the audience stayed, and others moved over to the side to stand under some trees with umbrellas. The choir was slightly amused. And you know what, the rain felt GOOD! The boys were smiling. It was exactly what we needed. They were totally excited that we were going to continue through the rain. I don’t know if it was a pride thing, or the whole thing was just funny – but they were loving it! We sang America, the Beautiful and the audience cheered. We continued with some of the “50 Years” medley, and as the rain continued, some guy came onto stage with an umbrella to cover me and the keyboard. The choir and I were definitely amused. Fortunately, the rain stopped after a few songs – but we were cooled off now and in a great frame of mind. The audience loved one song after another. They cheered every time a soloist began to sing. It was a really special moment. Afterwards, the choir was just in such great spirits. At least three or four said it was their favorite concert ever! I NEVER would have guessed that before the concert began. But it was indeed a special night, and I’m so happy and proud for the choir. OK, I’m really exhausted, so this is going to be really short – just the highlights, and it will probably be my last update until we return. Great sightseeing of the capital city of Vietnam. Rehearsal at the Youth Theatre, with children’s choir (Sol Arts Choir). We had a fun exchange with the children’s choir – especially after the concert…. Afternoon we visited the Thanh Chuong Viet Palace – an impressive little village that is still currently inhabited on weekends by some famous artist’s family. Following that was a ride through the Old Quarter of Hanoi. It wasn’t the rickshaw ride we were expecting, but rather an electric car that seats about 6 people. Tomorrow, we visit the beautiful Halong Bay – spending the afternoon on a cruise around the bay. Contact us … We’d love to hear from you! Did you know that there is a Philadelphia Boys Choir Alumni page on Facebook? Over 400 alumni are members. Join in on the conversation today!